This post is from Enroll Nebraska intern Sally Henry. As many of us know, either by word of mouth or firsthand experience, there are financial penalties for remaining uninsured if you are eligible to gain coverage under the Affordable Care Act. Two recent articles have reported that the penalty for 2016 is going up more than you may have anticipated. An article in the Wall Street Journal states that if people remain uninsured and do not get covered by the end of the official enrollment period, January 31, 2016, there will be no extension to avoid the law’s penalty. Although there was an enrollment extension earlier this year, the White House has reported in a blog post that there will be no changes to this year’s deadline. According to an analysis done by the Kaiser Family Foundation, the average household fine for not having insurance will rise by more than $300 from 2015 to 2016. The penalty in 2016 will now be the higher of two amounts — $695 per adult and $347.50 per child (up to $2,085 for a family) or 2.5 percent of the family income. 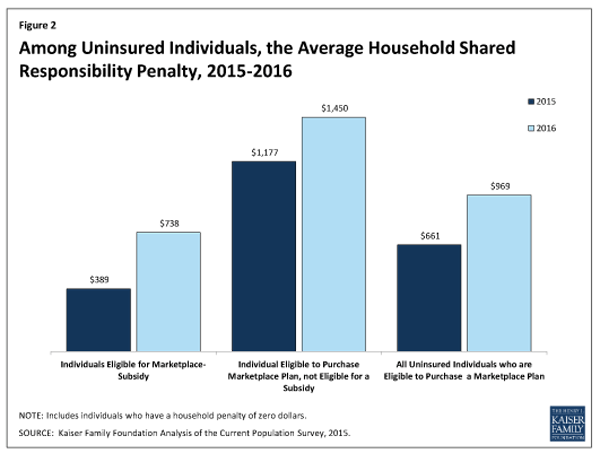 A Kaiser Health article also compares the average penalties from 2015 to 2016 among individuals who are eligible for Marketplace subsidies, individuals eligible to purchase a Marketplace plan without subsidies, and all uninsured individuals who are eligible to purchase a plan through the Marketplace. If you’re still looking for coverage or know someone who is, you can connect with an Enrollment Assister who can offer free help enrolling in an affordable health plan by visiting enroll-ne.org/local or by calling 2-1-1, United Way of the Midlands’ services referral center. You can also go on healthcare.gov to start an application today. ← Thankful for Health Coverage Day of Action Success!